Teams of UN Police of the UN Integrated Mission in Timor-Leste (UNMIT) and the National Police of Timor-Leste (PNTL) held a soccer match at Dili Stadium in observance of UN Day. 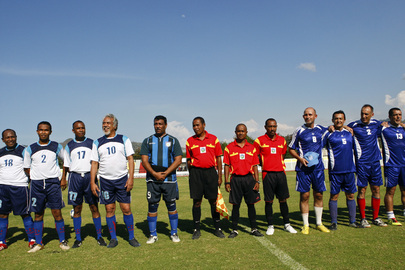 Timorese Prime Minister Kay Rala Xanana Gusmão (in number 10 jersey) took part at the start of the game. The event was also attended by PNTL General Commander Longuinos Monteiro (at right of the Prime Minister) and UNMIT Police Commissioner Luis Miguel Carrilho (fourth from right).